Today's Nintendo Direct revealed a new Animal Crossing app for Wii U, Animal Crossing Plaza. 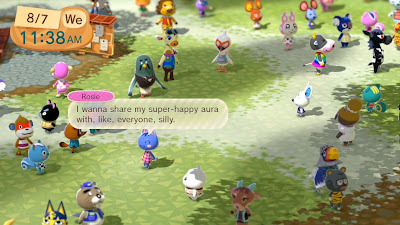 It's similar to the Wii U's home screen, Wara Wara Plaza, but it is instead populated with characters from Animal Crossing. It's primary purpose is to provide an interesting gateway into the new Animal Crossing Miiverse communities and to provide a way to easily share your screenshots from the game on Miiverse. You're also able to make a profile for yourself and list your town name, character name, favorite Animal Crossing character, and dream suite ID. Screenshots can be easily uploaded and organized into albums by inserting your 3DS's SD card into the Wii U. Images on your Wii U can then be posted to Miiverse from there or can be categorized by character if you select a character from the plaza. There isn't a whole lot to this app, but without a 3DS version of Miiverse available yet, it's the best way to post about your adventures in Animal Crossing. Seeing all the characters in HD is also a plus. The app is available for free and will be functional through 2014. Note: Most interaction and menus are viewed only on the GamePad. During the Nintendo Direct, this was announced after noting all the regions where Animal Crossing: New Leaf is currently available. While it is possible to view Miiverse posts from other regions through this app and during regular Miiverse use, both the Wii U and Animal Crossing: New Leaf still do not allow typing in characters from languages in other regions, both the 3DS and Wii U are still region locked, and the player character in Animal Crossing still can't be naturally dark skinned. Hopefully, in the future, Nintendo will get fully on board with uniting its worldwide market. Pokemon X and Y's worldwide release seems to be a step in the right direction. Update: I took some HD screenshots that would make good wallpapers. Have at 'em! For more handy Animal Crossing tools, click on over here!